I hope you’re hungry, because this week is going to be recipe week on Au Coeur. I have a huge backlog in my picture files (still thankful Chris rescued them!!) and am going to make myself share them with you. Second, life just seems to get in the way. I love food. I’m so thankful for the amazing recipes shared by some of my currently favorite food bloggers and I do think many recipes are just dying to be shared. Eating should be a communal experience and with family so far away and friends rarely sharing dinner I’m thankful for the breaking and sharing of bread online. I want to participate in that, but when it comes down to it, there is only so much time and there are so many things to write about. So food gets put on the back burner. All that, and yet I do have good food writing intentions and so I take pictures and pictures and pictures as I cook. And I even attempt to scribble down recipes for the things I ake off the top of my head, which is a challenge in itself since I don’t really measure much anymore. So this week I’m going to put those good intentions to that test and I’ll add a few more recipes to the site for you to enjoy…though I’m sure my measly attempts at food blogging will remind us all to be thankful much better food bloggers are out there! Oh, yes, and let’s be thankful for Epicurious, too. My most favorite of online recipe banks. Preheat oven to 350°F. Bring milk, sugar, sage, and salt to boil in heavy medium saucepan. Reduce heat to medium-low; gradually whisk in cornmeal. Cook until cornmeal absorbs milk and pulls clean from bottom of pan, stirring constantly, about 5 minutes. Whisk in 3 tablespoons butter. Whisk yolks in large bowl to blend. Gradually whisk in warm cornmeal mixture. Whisk in baking powder. 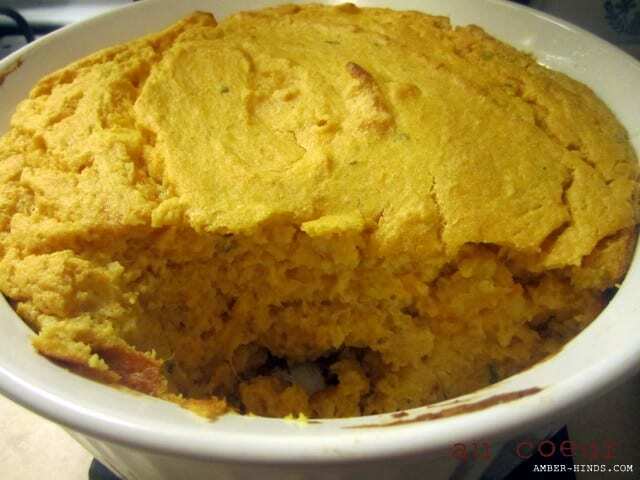 Mix sweet potato mixture into cornmeal mixture. Beat egg whites in medium bowl to medium-stiff peaks. Fold whites into warm cornmeal mixture. Melt 1 tablespoon butter in large baking dish in oven. Remove from oven and swirl pan to coat. Pour batter into baking dish. Transfer to oven; bake spoon bread until top is golden and puffed, about 1 hour. Serve warm.